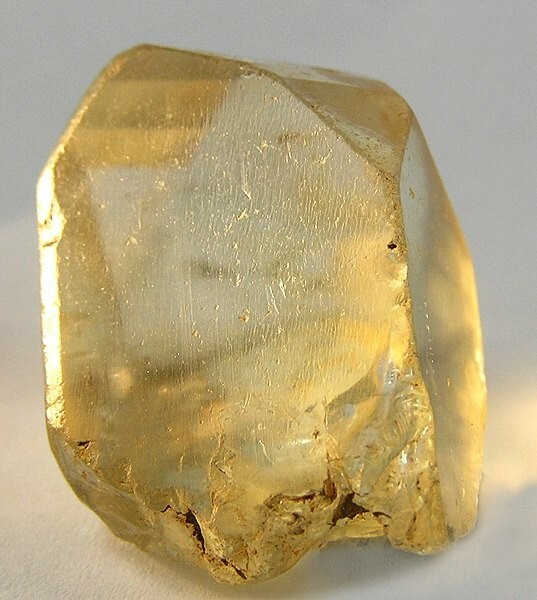 Locality: Jos Plateau, Plateau State, Nigeria (Locality at mindat.org) Size: 2.6 x 1.6 x 1.5 cm. This is an old-time African topaz specimen accompanied by an old Hugh Ford label. It is really a super crystal, complete and undamaged all around, with the contact on the bottom naturally healed, probably from spending time in a stream bed. The crystal is of champagne color, and the faces have a wonderful silky luster. Weighs 15 grams. This page was last modified on 13 January 2019, at 03:37.